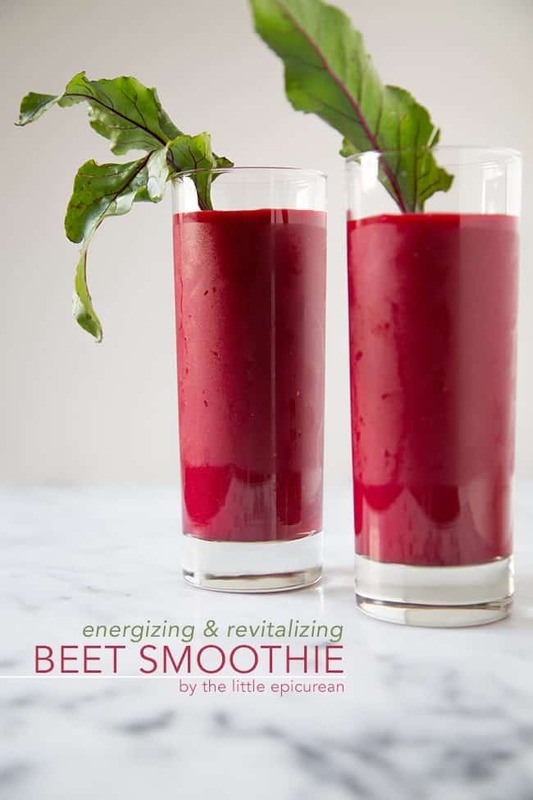 Beets deliver a welcome sweet earthiness that plays well with the fruits in this energizing beet smoothie. My first encounter with beets happened when I was a kid eating dinner at Sizzler. (Don’t laugh. Back in the early 90s when I was in elementary school, Sizzler was the IT place to be.) I loved the kids’ buffet section, you know, the one with the lowered counters and the never ending supply of onion rings and chicken nuggets. While I loaded my little plates with fried food, my mom would be at the salad bar gathering us greens to eat. This particular dinner, she handed me a plate of salad with red slices on top. Even though she put ranch on the side, I immediately expressed disgust. YUCK! I don’t like cranberry sauce! I don’t want to eat that! (Yes, I HATE cranberry sauce. I don’t understand that strange jiggly cylindrical red thing that always shows up on the Thanksgiving table.) My mom laughed and told me those red things were beets. Beets? What the heck was that? I looked over to my dad and saw him happily eating them. If my dad eats them, it is safe to assume that these beets are in fact edible. I took a bite. WOW! These are sweet! And since that dinner, I happily eat beets whenever my mom puts them on my plate (even now when I’m almost 30). While I normally use beets for salads, I thought it would be fun to whip it into a fruity beet smoothie. I wasn’t sure how it was going to taste mixed with tangerine juice and peaches, but I was certain I’d end up with a pretty and vibrant colored drink. Though beets are inherently sweet, they are rarely associated with desserts or fruit smoothies. It’s time to change that. I am not really into juicing. Probably because I don’t have a juicer. But mainly because I don’t like how thin juices are. I’m one of those people that like my orange juice full of pulp. I want substance. I want richness. I prefer to use a blender because it keeps all the nutrients and fiber, making for a rich smoothie with body. At first sip, I just got a mouthful of earthy beet flavor. However, by the second sip, it turns into this sweet, tart, complex taste that I just can’t get enough of. The beets deliver a welcomed earthiness that plays well with the sweetness from all the fruits (tangerine, strawberry, peach, and mango). Asides from being “nature’s candy,” beets are also very good for you. 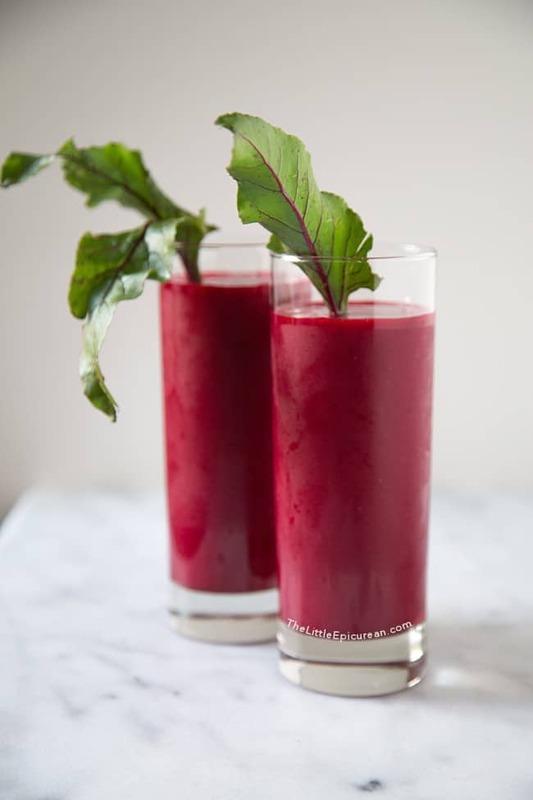 Full of folate, manganese and other nutrients, beets help with blood flow, making this beet smoothie great for pre/post-workouts. Only word of warning- when working with red beets be very careful as they can stain cutting boards, hands, and clothing. Asides from being called "nature's candy," beets are full of good for you vitamins and nutrients. Drink up! 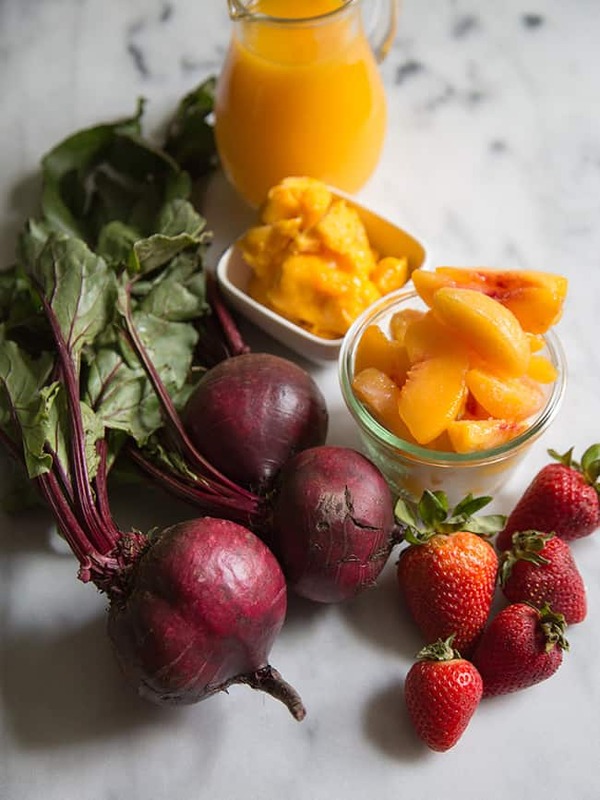 In a blender, add tangerine juice, chopped beets, strawberries, mango, and peaches. Blend until smooth. If smoothie is too thick, add water or additional tangerine juice 1 tablespoon at a time. Serve immediately, or keep covered in the fridge until ready to drink. Stir before drinking. Hi! I initially read it “BEST SMOOTHIE” instead of “BEET SMOOTHIE”! I love beet but I’ve never thought of using it in smoothie. What a great idea! The color is absolutely amazing!! 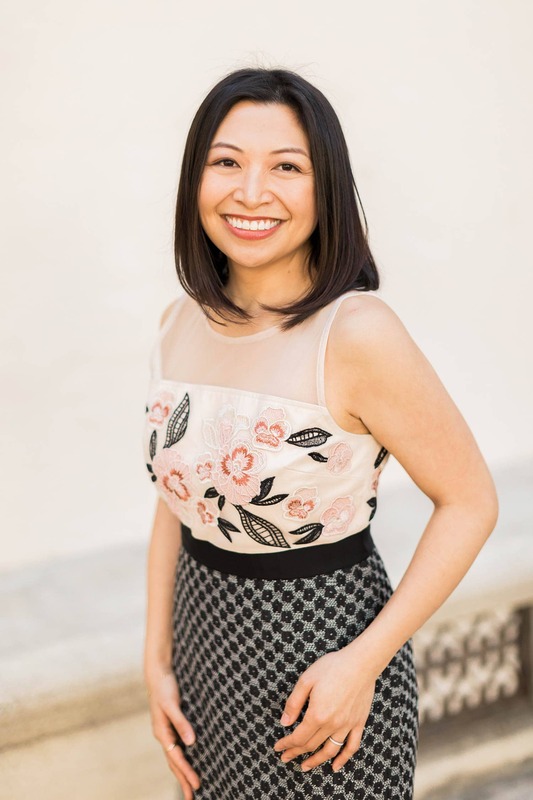 Hi Reiko! Best or beets, what’s the difference? ;) Thanks! Looks super tasty!! The beet root gives it gorgeous colour aswell! Wow, can’t get over the gorgeous colour of this smoothie!! I love the idea of adding beets to a smoothie. You always see them in juices but rarely smoothies. I also like your photo styling with the beet greens. Super cute! Thanks Brittany! I used the beet greens just for styling purposes, but later someone told me you could actually cook and eat them! Gorgeous! I have beet juice every single morning :) so I would be intrigued to try out this smoothie! Hey! 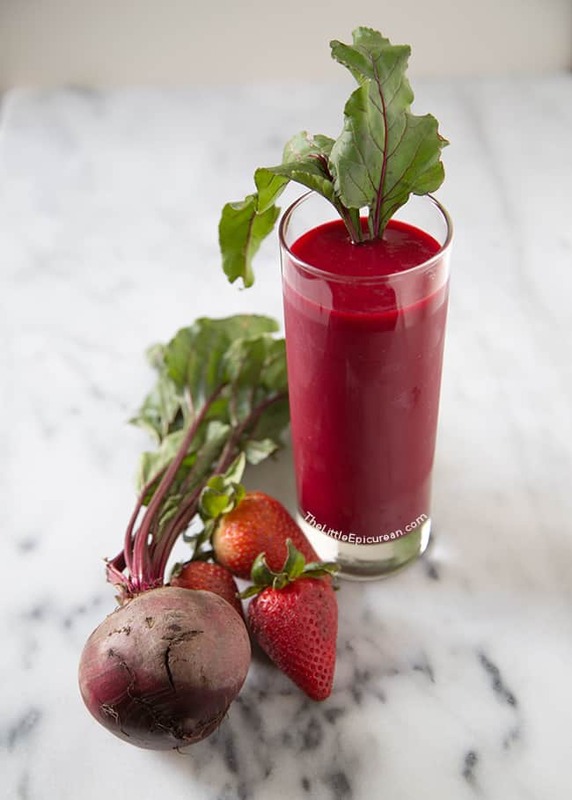 Do you boil the beets before making the smoothie? I mix them raw. How do you guys do it?